If there is one important technique to understand when it comes to great urbanism, it’s the golden triangle. This condition, when properly configured, cuts across all cultures and architectural styles. It’s easy to define, simple to construct, and operationally intuitive. Yet, why does this basic principle get violated time and time again? It starts with a patent misunderstanding of what pre-conditions walkable urbanism. Most people assume that a great street must be constructed using gold plated design – all brick sidewalks, antique-finished street lights, glossy wayfinding, and these days, integrated bio-retention areas. Cities and business districts spend millions of dollars on such improvements in the hopes of attracting investment back to an area. And yet, far too often, the public investment is too one-sided – too much public investment with little to no commitment from the private sector. Quid pro quo is critical to revitalizing business districts and getting it right from the beginning is equally important in new village centers. The golden triangle is the intersection of the public and private realms – where buildings meet their fronting streets, and where pedestrians, cyclists, and cars (usually parked) interface. This should not be confused with the sight distance triangle mandated by highway departments to be-rid all thoroughfares of life-giving activity. Very simply, the triangles’ height consists of the the fronting building facade – typically the first story and a half – and its integral use(s). The base ties together the public realm including the width of the sidewalk, pedestrian amenities such as seating and streetscaping, bicycle amenities such as bike parking and travel ways, and on-street parking. On Street Parking: I can’t emphasize enough how important on-street parking is to a walkable, urban environment. Without it, some perception of convenience is lost and perception of safety as a pedestrian moving along a corridor with moving cars within a few feet is not an optimal arrangement. Sidewalks: As the picture from Ann Arbor, Michigan shows, sidewalks don’t have to be all brick. Simple concrete will do just fine as long as you cover them with activity – moveable chairs and tables, pedestrian signage, outdoor displays, landscaping, and of course, people, lots and lots of people. They need to be wide enough to accommodate a number of activities but no so wide that they look windswept without it. Ground Floor Transparency: Windows and doors are essential to encouraging pedestrians along down the street. As a species, we become bored too quickly on our journeys and will find other routes if a storefront is dark. Blank walls are the same thing – boring and unsafe. Storefront glazing transmits light from the inside to the sidewalk area at night, lighting the pathway; provides passersby with a connection to the activity on the inside; and softens the visual aesthetics. 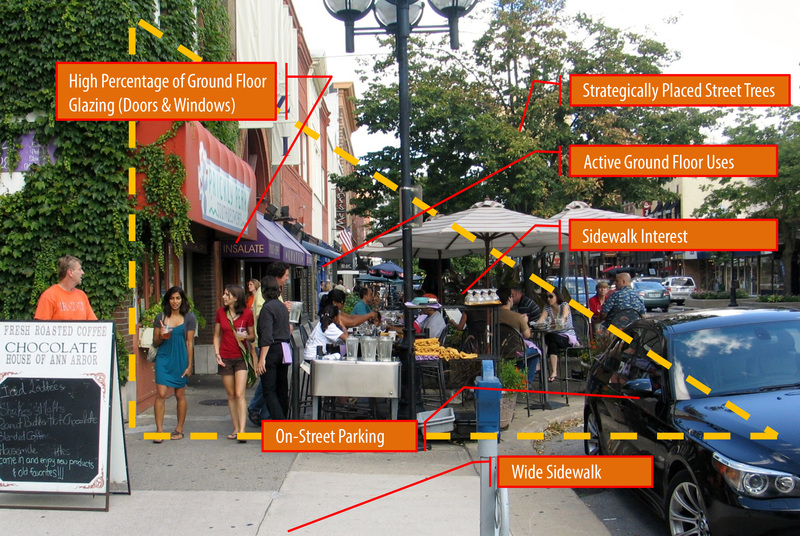 Uses and Activities: Active uses such as shops, restaurants, and entertainment are so critical to street life that their subsidizing their initial entrance into the area is actually much more important that spending millions on a streetscape project. In fact, we have probably all been to lots of areas with small sidewalks (Charleston, SC) or poor streetscape amenities (University Hill in Seattle, WA) and yet were thriving places. Use trumps infrastructure nearly every time. It should come as no surprise that the very best places exhibit a height to base ratio of 1:1. Twenty to thirty feet of public realm for an equivalent amount of private realm. One story buildings can work well, so long as they have a high enough facade to enclose the sidewalk area. It should also come as no surprise that these places are quickly becoming places of choice for employers and retailers alike. Living near great urbanism increases WalkScores which has been statistically shown to increase home value. Recent documentation of preferences by employers small and large to be in or near these places further underscores the economic value of great urbanism. All of this contained in a simple right triangle.